Increases horsepower by reducing accessory drag. 12.5-15 h.p. at rear wheels typical. Eliminates belt throwing. Designed for normal street driving. CNC machined to run perfectly true. 6061-T6 aluminum for extra strength and wear. Finished with a “No Polishing” clear powdercoat. Increases cooling by speeding up water flow and fan speed. This helps at critical low speed driving where most overheating occurs. Precision CNC machined from billet 6061-T6 aluminum. Finished with a “No Polishing” clear powdercoat. 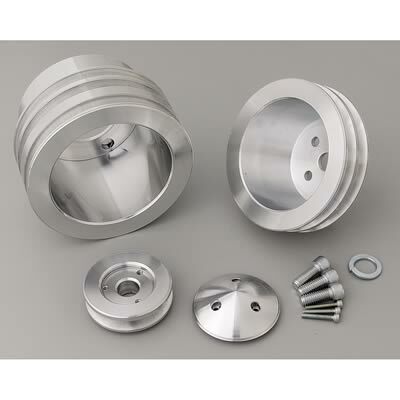 Note: Damper face to water pump flange face 3 1/4"
Optional P/S pulley 289-302 C.I. Optional P/S pulley 351 C.I. 1614 1-Groove Crank Pulley 5 1/2"
1612 1-Groove W/P Pulley 6 1/4"
137 1-Groove Alt. 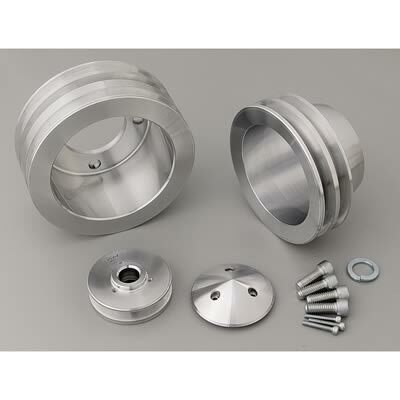 Pulley w/Cover 2 11/16"
1611 1-Groove Crank Pulley 5 1/2"
1613 1-Groove W/P Pulley 6 1/4"
1625 Set Drives: W/P, Alt., P.S. 1631 2-Groove Crank Pulley 5 1/2"
1630 Set Drives: W/P, Alt., P.S. 1632 2-Groove W/P Pulley 6 1/4"
1651 3-Groove Crank Pulley 5 1/2"
1691 3-Groove Crank Pulley 5 3/4"
1618 1-Groove W/P Pulley 5 1/4"
1616 1-Groove W/P Pulley 5 1/4"
1657 Set Drives: W/P, Alt., P.S. 1667 Set Drives: W/P, Alt., P.S. 1633 2-Groove W/P Pulley 5 1/4"
Note: Damper face to water pump flange face 3"
1552 1-Groove W/P Pulley 6"
1635 Set Drives: W/P, Alt., P.S. 1545 2-Groove Crank Pulley 5 3/4"
1547 3-Groove Crank Pulley 5 3/4"
1553 1-Groove W/P Pulley 5"
1637 Set Drives: W/P, Alt., P.S. 1563 2-Groove W/P Pulley 5"
Note: Damper face to water pump flange face 3 7/8"
1551 1-Groove Crank Pulley 5 1/2"
1560 Set Drives: W/P, Alt., P.S. 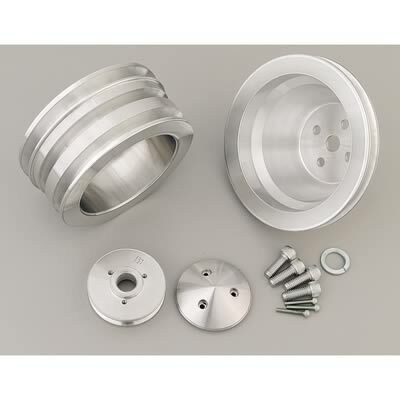 1561 2-Groove Crank Pulley 5 1/2"
1593 3-Groove Crank Pulley 5 1/2"
1565 Set Drives: W/P, Alt., P.S.